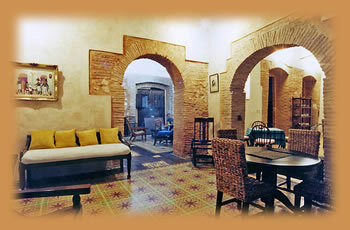 The old ancestral colonial mansion, dating back from Diego Columbus' time (son of Christopher himself) was totally renovated and transformed into a hotel in 2004. Our 12 rooms feature Cable TV, Air-Conditioning, fan, king size or queen size "Serta-Pedic" beds, and stylish private Andalusia bathrooms. Prices include breakfast as well as all taxes and service charges. 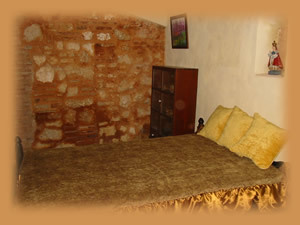 Telephone, high speed Internet access are also available in each room, safe boxes are optional. Columbus Room Featuring 1 Queen bed plus - 1 Full sofa bed - two level mezzanine in 15 feet high ceiling. - Intimate private bathroom - AC -TV - telephone - high speed Internet. Sleeping up to 4 people. Room deluxe Antonetta Nice and spacious. Featuring 1 Queen plus 1 twin (optional) -Large Private bathroom AC - TV - fan - telephone -high speed Internet. 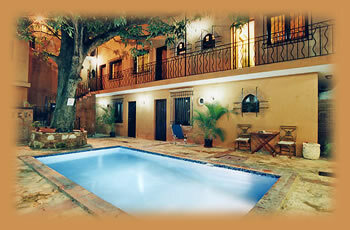 Very elegant and comfortable, gallery, large window view of patio, mango tree and pool. 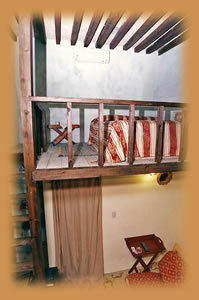 Rey Ferdinand, Deluxe: Junior suite room featuring one King plus one Queen size bed. Large double bathroom "his and hers ", with mosaic tiled shower . Armoire, desk, TV, AC, fan, telephone, high speed internet. Comfortably sleeps 4 people or even 5, with extra twin bed. Isabella La Catholica Suites: This elegant Suite is decorated with fine period furniture. One large King size plus one Queen size bed in 2nd adjoining room. Extra Queen bed, optional. Sleeping 2 to 6 people. Armoire, desk, TV, AC, fan, telephone, high speed internet. 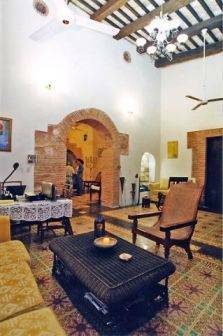 Large Andalusia bathroom with exterior Moorish bath. The Hotel Doña Elvira is the latest addition to a collection of the most exquisite hotels in Santo Domingo, Dominican Republic and the Caribbean. Witness the old Spanish colonial heritage, museums and monuments all within a block or two away from the hotel, Alcazar de Colon, Cathedral de Las Americas, Parque Duarte, Casa Reales, Calle de las Damas. No-show charges or late cancellation 20% or 1 night.